The Emprise Bank Secure Email Message Center is a secure way to compose, receive, view, reply to and forward encrypted messages. The secure email system may only be used for sending or receiving email with an Emprise associate. 1. 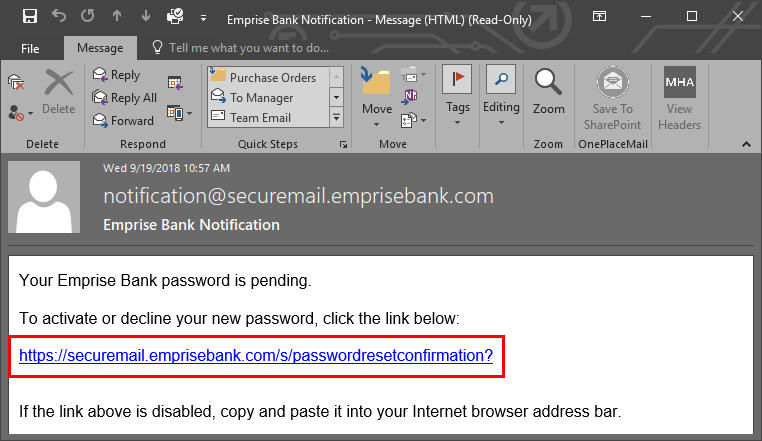 Go to https://securemail.emprisebank.com/. First time users should create a new account. If you already have an account, proceed to step 6 and follow the login instructions. 2. When creating a new account, you will be asked to enter your email address and create a password and password reminder phrase. 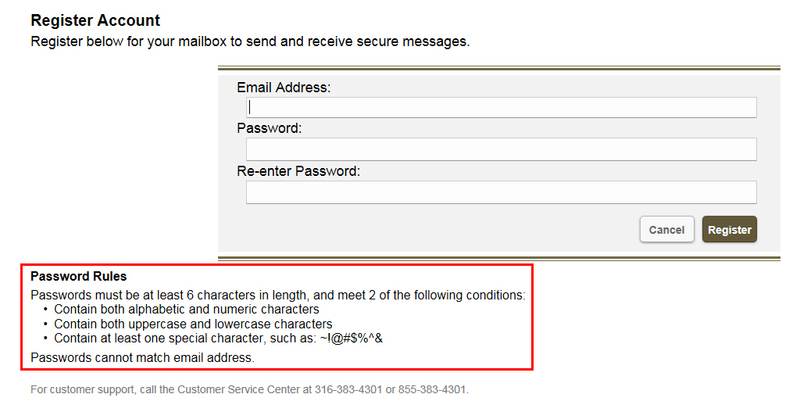 Please pay attention to the password rules on this page. 3. A confirmation email will be sent to the email address provided. 4. Click on the link within the email to activate your account and password. 5. You will be redirected to the secure email website. Click on “Continue” to proceed to the sign in page. 7. The window will now display your Inbox. Click on “Compose” to begin a new message. (1) Click on “Browse…” and locate the document on your computer and double-click on it. (2) Click on “Add File.” Repeat steps 1 and 2 to attach multiple files. Note: You may attach as many as 10 files up to a total of 50 MB. For larger files, please speak with an Emprise associate. 10. The document name(s) will now be reflected in the “Attachments” field. You may continue to add other attachments or remove files as needed. 11. Click “Send” to send the message or “Save Draft” to save the message and return to it at a later time. • “Address” to view or create contacts and groups of contacts. • “Sent Mail” to display messages previously sent. • “Drafts” to work with items that had previously been saved but not sent. • ”?” (Help) to see additional resources including a product overview, message options and frequently asked questions. 1. 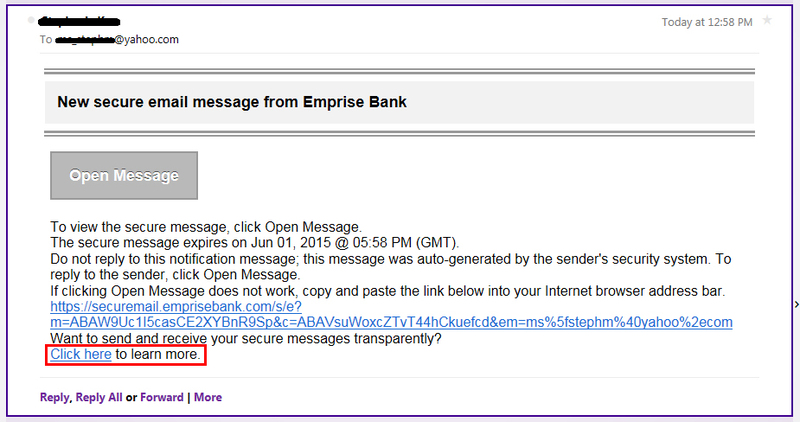 When an Emprise Bank associate sends you a secure message, you will receive an email such as the one below. Click the “Click here” hyperlink within the message, or copy and paste the text from the bottom of the message into your internet browser as directed. 2. You will be redirected to the secure email website. 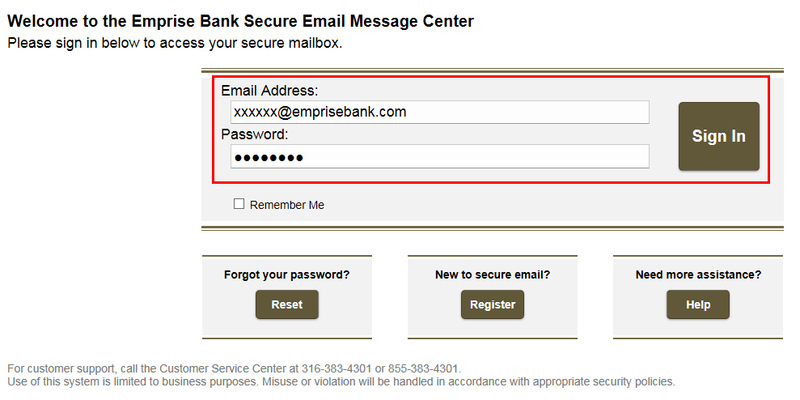 Enter your email address and the password previously created and click on “Sign In.” If you do not have an account, follow steps 2 – 6 (above) to create a new account. 3. Once you have logged in, the sender’s message will now display in your Inbox. You may also click on and open any documents which may be attached to the message. If you choose to respond to or forward this message to another Emprise associate through the site, you will be sending the information securely to your chosen recipient(s). Please note: Messages automatically expire after a certain period of time. The message expiration date displays in the details of each email message you receive. If you want to keep a copy of the message after its expiration date, you can print it, save the message as a text file, or save the message and any attachments as a .zip file.